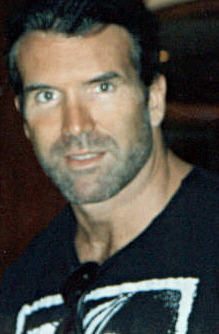 Scott Oliver Hall (born October 20, 1958 in Chuluota, Florida) is a former American professional wrestler who is best known for wrestling with both the World Wrestling Federation (WWF) under the ring name, Razor Ramon and in World Championship Wrestling (WCW) where he wrestled under his real name. Hall was a founding member of the professional wrestling stable, the New World Order (nWo). In 1983, he was charged with second-degree murder after he wrestled a gun away from a man and shot him in the head at point blank range with it during an altercation outside of a nightclub. He said it was in self-defense and the charges were dropped because of lack of evidence. He did admit to killing the man, and says he is unable to forget the incident in a 2011 interview with ESPN. Hall has had many other legal and drug problems since the 1990s. Retired professional wrestler Diamond Dallas Page invited Hall to join stay at his house to stay sober and rebuild his life. He also invited him to join his yoga program which many current and former professional wrestlers are involved in. He was ranked #7 of the top 500 singles wrestlers of the year by PWI in the PWI 500 in 1994. He was ranked #72 of the top 500 singles wrestlers of the "PWI Years" in 2003. He along with Kevin Nash was ranked #40 of the Top 100 Tag Teams of the "PWI Years" in 2003. ↑ "Youtube - E60: The Scott Hall Story". ESPN and YouTube. Retrieved 2013-06-12. This page was last changed on 19 April 2018, at 21:08.